Strategic Affairs Ministry to assist Jordan Valley farmers reach new markets and overcome boycott organizations. The Strategic Affairs and Information Ministry headed by Likud Minister Gilad Erdan, has allocated close to NIS 7 million (Approximately $2 million) over the next two years for a joint project with the Jordan Valley Regional Council to publicize Jordan Valley agricultural produce at major conferences around the world. In addition, the Ministry will finance delegations of world public opinion leaders to the region so that they gain an impression of the agricultural produce and especially of the local cooperation between Israelis and Palestinian Arabs in developing agricultural products, believing that economic activity in the Jordan Valley and Judea and Samaria constitutes a key to creating economic ties "enhancing chances for peace." During a New Year's toast held in the Jordan Valley with the heads of the Yesha Council, Minister Erdan said his ministry is trying to help farmers affected by anti-Israel initiatives to label and boycott products from the Jordan Valley, because Jordan Valley settlements and farmers are at the center of those agricultural boycott efforts and are the farmers most harmed by the slander campaign. 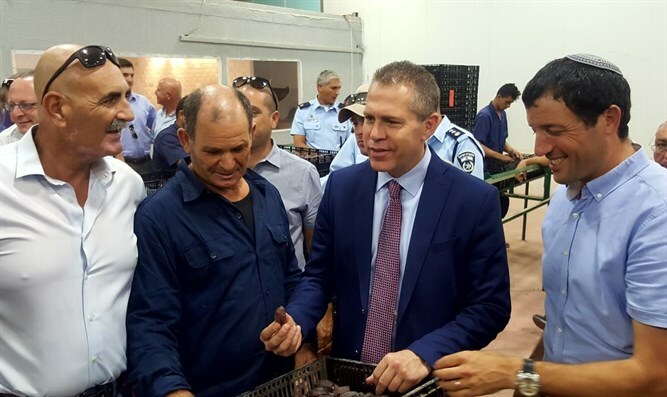 "My struggle against the boycott organizations prevents severe damage to the State, and one of the important at-risk areas of focus is Israeli agriculture," said Minister Erdan, "We must promote and publicize the quality of Israeli agriculture and protect it." David Elhayani, head of the Jordan Valley Regional Council and chairman of the Settlement Forum for Combating the Boycott, said the project would help area residents. "Our produce is banned in some countries in Europe and America, causing great damage to farmers, so we are pleased with the government's change in direction and the assistance given by Minister Erdan. Together, we formulated a comprehensive plan of action for the Strategic Affairs Ministry and finally see activity to benefit the farmers and victims of product labeling which will help in the struggle and promote Judea and Samaria agriculture. As farmers in the Jordan Valley in particular and in Judea and Samaria in general, we see a light at the end of the tunnel," said Elhayani. "There are currently 14 industrial zones in Judea, Samaria and the Jordan Valley that employ nearly 20,000 residents of the Palestinian Authority," said Avi Roeh, head of the Yesha Council and head of Mateh Binyamin Regional Council. "There are those who do not care, they boycott because they want the State of Israel not to exist." "Agriculture and industry, certainly in Judea, Samaria, and the Jordan Valley, benefit the entire population in the region. From the Jordan Valley we wish to proclaim the news today by cooperatively signing the agreement, because this is not a task of the Jordan Valley or residents of Judea and Samaria alone, but of all the residents of Israel," concluded Roeh.